It’s green, strong and possibly hallucinogenic. Nicknamed, "the green fairy" the drink Absinthe is to be made legal again in France. The French drink of the impressionist painters and writers of the late 19th century is to be made available in France once more. The Green fairy was seen as a magical source of inspiration. France banned the drink in 1915 because it was thought it had very harmful effects. 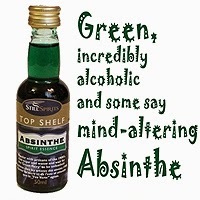 It is still true that when people hear the name Absinthe they think of poison. Absinthe is made from wormwood which contains levels of "thujone" a supposed hallucinogenic. Absinthe is drunk mixed with water and sipped because of its strength. At the height of its popularity in the late 19th Century it would have been plentiful because its other use was as industrial alcohol. Although many countries banned Absinthe they have all since lifted the ban and started to produce their own versions of this mysterious drink. Recipes have beenrevived and new versions have been made all around the world. The law was also eased in France allowing the drink to be made in France again but not to be labelled Absinthe but "Absint". Now again it is legal. Absinthe drinker “Clement Arnoux” hopes that many more bars and shops will start to sell absinthe now. "We have forgotten almost everything about it, and are re-learning it from foreigners," he laments. Mixing Instructions: Add this beverage flavouring essence to 2.25 Liters (2.3QT) of 40% distilled spirit or vodka. Makes three 750ml (26 fl. oz.) bottles. Shake well before use.